anyone else ever think the lion's head looks kindof mouse-ish? 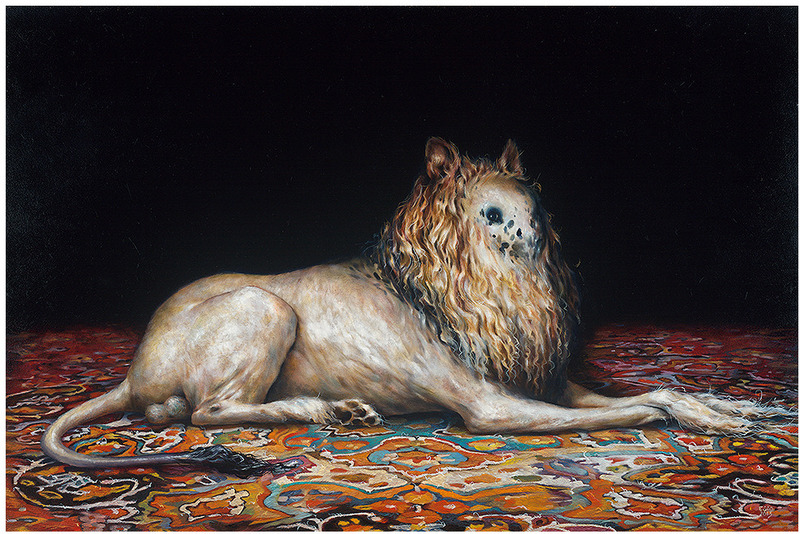 i was kind of surprised by them using this "Losa Lion" painting cause its from early 2013. remind me of the rabbit one. except for the sack. lol. rug is very cool. yeah i agree it's strange to see them use that painting. Doesn't seem like a commission for the new album, but it does work in some weird way; at least symbolically. Lion is pretty disfigured and zombie-like. i could see the mouse face you're talking about Roy. The paws are also really tiny for a lion like that. I think It's a cool painting too. Leaves you with questions. the paint quality is also really nice. I'm sure he put the ballsack in there for some meaning as well. Might have some historical context. I've noticed Esao play with his images like that before. in this case, i love being wrong. solid songs, good song writing, but theres something lacking in it making it hard to call it great. I honestly wish they would work with someone else than Will. 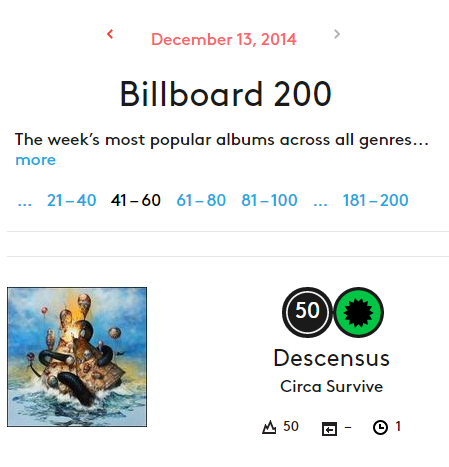 I feel BSN was their best effort from beginning to end and was a timeless record... OLG had the best vibe and Juturna is juturna..
Descensus is a great album from Circa Survive, but if you asked me what album defined the band, Descensus wouldn't be my first choice. very curious of the fate of this song. Its just speculation but he's got 13 songs on that list. 787 might be one of them. Decensus is about 50 minutes long, so the 3 extra songs are a combined 12 minutes. Idk. 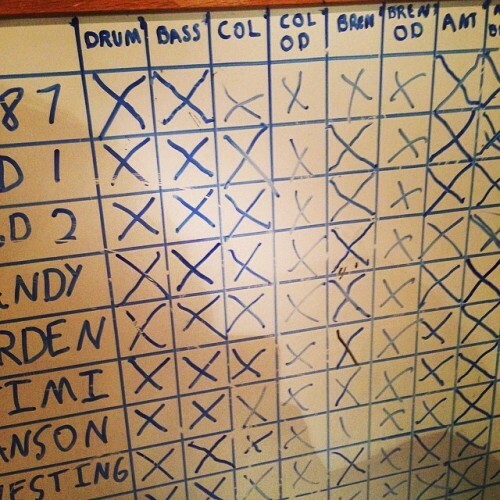 The whiteboard lists 11 songs. Not all of the songs are completely accounted for due to not knowing the working titles of some descensus songs. Its also possible that some tracks were split or combined, but I'm kinda doubting it. 11 songs seem to have been recorded. 10 songs were released on Descensus. And 787 was tracked fully but remains unreleased. 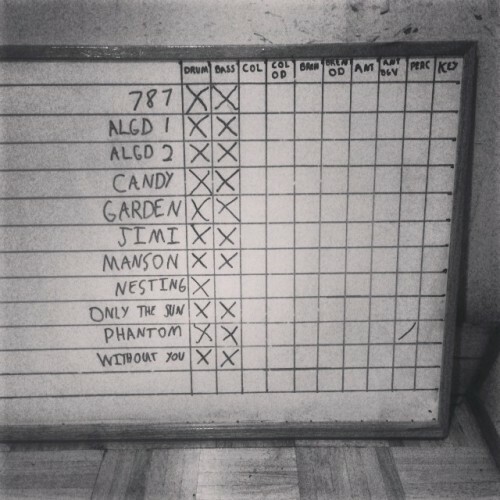 I'm also speculating, but i noticed that in the pic of Wills computer screen, two of the songs, Schema and Phantom say "Revised" after them. Maybe the two "Unrevised" versions of those songs are still in that folder, accounting for tracks 12 and 13? Idk. And it seems that whatever track 11 is seems to begin with the letter A. Maybe 787's official name starts with A? idk. Possibly airplane or aircraft as in a Boeing 787? i'm pretty sure the working title, 787, itself is a reference to an airplane/aircraft. but in the pic, we would see the dot for the "i" if the second letter was "i", because of the font style. imo, the 2nd letter has to be: u, v, w or y.
yep. thats what it ended up being.